After listening to a recent podcast on artfiarinsiders.com about two different artists who each did a series of daily paintings for a time, I have decided to do my own painting challenge. With my schedule there is no way I could do one painting every day, however, I should be able to do one a week. Every Wednesday I will post a new painting, finished and available to purchase. I have been working on a series of women throughout history. So we are going to be calling this Women's History Wednesday, or something like that anyway. Along with a new piece of my artwork will be some information about the women. I will also be including these in my e-newsletters but once a week may be too often for that. I will most likely lump a few together and do a monthly re-cap in the e-newsletter. You can sign up for my e-newsletter here. Let's get started with Empress Theodora. 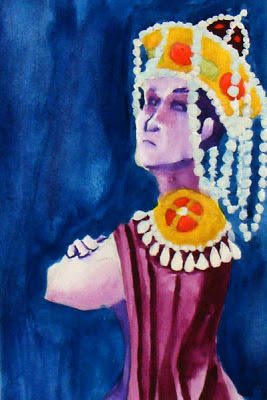 Theodora started off as an actress, a dancer, and well basically a high end prostitute. Eventually she bumped into Justinian I, who ruled Constantinople. After seeing one of her performances, he ended up changing the laws so he could marry this beautiful woman. Turns out, she was also very intelligent. He ended up making her co-regent which meant that they shared the throne. One day a riot broke out at a sporting event at the hippodrome. Justinian was ready to leave town in hopes of exile instead of death. At the docks Theodora put her royal foot down. She had worked her way up from actress to empress, she wasn't going anywhere. She told Justinian and his crew that "purple makes a fine funeral shroud" and that she wasn't going anywhere. Her speech convinced her hubby and crew to stay. Justinian and Theodora survived and put Constantinople on the map. They built buildings that still stand today, the most famous being the Hagia Sophia.